I really don't know if it is related to my giving up diet soda, but I feel much better overall. Where did you read you should be drinking more than a GALLON of water a day? That's preposterous! Please give a source. Your body already has a method for telling you how much water to drink. Thirst. If you're thirsty, drink. If you're not thirsty, don't. If you're forcing yourself to drink when you're not thirsty to fulfill some silly quota, you're doing the wrong thing. And you know this already. Where does this junk science come from? Don't forget that 25% of your daily water comes from your food. The national health institute recommends 1ml for every calorie you consume. If you eat 2000 calories, that's like 65 oz, minus the quarter that's in the food, that leaves around 48 oz. And you're forcing down 150? Yikes! I've also read similar in other places. Also, I am not forcing myself to drink. I am very active at work and constantly on the move during my 9 hours there and as such I drink a lot. 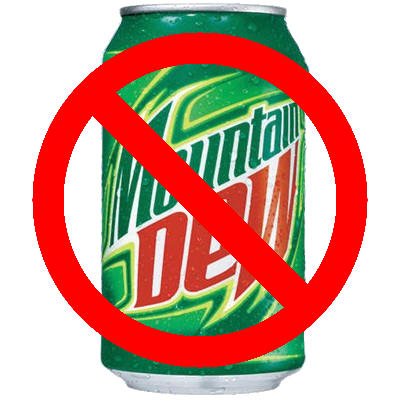 Congrats on giving up soda for a day, now lets work on day 2.
boooooooooooooooooooooooooooooo. mountian dew is the nectar from the gods,sir.moderation is the key,bro. we,as a species didnt evolve from apes to drank water. lol. Moderation is key but I don't currently drink dew moderately. So, hopefully after going through this I can be happy limiting myself to some once in a while instead of multiple all day every day.